November 9, 2011 - U.S. Customs and Border Protection officers at Chicago's O'Hare Airport on Monday made an interesting discovery in outbound mail of a live Vietnam-era military incendiary device that was being shipped on a flight to Japan. CBP officers found the device while examining outbound mail packages. The item was manifested as a “military training dummie” valued at $55 and was being shipped from Missouri to Japan. Prior to initiating seizure, CBP officers spoke with the shipper who indicated that the item was acquired from an estate sale and sold on-line. 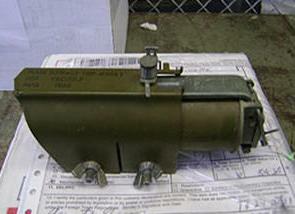 Based on the officer’s experience, the Chicago Police bomb unit was contacted and subsequently determined that the item was a live incendiary device, a phosphorous-based flare M49A1. Working with U.S. postal inspectors and the Chicago Police bomb unit, the device was rendered safe and destroyed. The case is under investigation; however, it is not believed that there was harmful intent by the involved parties. This live Vietnam-era military incendiary device was intercepted by CBP officers as it was being exported through the mail. The M49A1 trip flare is an early warning signaling device used to warn of infiltrating troops by illuminating the area surrounding the trip flare. This type of trip flare will provide a light intensity exceeding 35,000 candelas for approximately one minute where it can reach a temperature of almost 5,000 degrees Fahrenheit. CBP officers and agriculture specialists are stationed at international mail facilities located throughout the country. CBP conducts enforcement operations on international mail and is on the lookout for any type of contraband or prohibited items being shipped into or out of the U.S.